On the strength of RHP John Simms’ eighth quality start in his last nine starts, the Potomac Nationals (35-39 Overall, 20-17 Home, 2-2 Second-Half) hooked the Carolina Mudcats (37-37 Overall, 14-21 Road, 3-2 Second-Half) by the final score of 7-2 in series Game Two of a three-game homestand on Monday evening at Pfitzner Stadium in front of 5,137 fans. The Nationals captured their third series win over Carolina in 2015 and the Red, White, and Blue is now a (10-3) club against the Southern Division squad. The P-Nats are now riding a season-best five-game winning streak at home inside the friendly confines of The Pfitz. Simms (4-5), the winning pitcher, dealt 6.0 innings and allowed just one unearned run on three singles without walking a batter. Simms tied his season-high with four strikeouts overcame hitting one batter. Mudcats RHP Max Povse (0-1) took the loss in his Carolina League debut after surrendering six runs (five earned runs) on nine hits. Povse issued two free passes, struck out only one batter, hit a man, and let go of one wild pitch. Carolina struck first in the opening frame as RF Connor Lien was plunked close to his hands by Simms and scored after stealing second base and advancing to third base on a groundout. Lien was plated when a swept grounder by DH Jacob Schrader resulted in an errant throw by Nationals SS Stephen Perez that pulled Potomac 1B John Wooten off the first base bag. Potomac tied the contest in the last of the 1st when C Spencer Kieboom, as part of a three-RBI night, delivered CF Narciso Mesa on a 6-3 run-scoring groundout. Mesa reached on an infield single behind the pitcher’s mound to begin the Nationals’ offensive story. The Nationals exploded with four runs off Povse in the 2nd inning to grab a 5-1 lead. Back-to-back RBI singles off the sticks of Mesa to left field against a drawn-in infield defense and Perez through Carolina 2B Reed Harper into right-center field led to a bases-loaded two-run single punched into right field by Kieboom. The Nationals got to Povse for another run in the 3rd inning to take a 6-1 advantage when DH Brandon Miller socked a single into right-center before 2B Adrian Sanchez doubled to the right field corner. Miller scored on a passed ball charged to Mudcats C Jose Briceno. After blasting a double to the dead center field wall against Carolina RHP Mauricio Cabrera in the 5th, Miller got to third base on Cabrera’s first wild offering and took the home plate dish on his second wild one giving the home club a 7-1 edge. Mudcats RHP Britt Robertshaw pitched 2.0 scoreless frames behind Cabrera to prevent further damage created by the Nationals. The duo of Potomac RHP Derek Self and RHP Brian Dupra combined to turn in one scoreless inning per hurler in the 7th and 8th innings, respectively. Self walked two but fanned a pair while Dupra struck out one in a perfect stanza. Nationals RHP Manny Rodriguez finished the game in a non-save situation. “Man-Rod” struck out Schrader hacking and Carolina 3B Carlos Franco looking but then allowed a string of three straight singles. Briceno dumped a single into the right-center alleyway, 1B Joey Meneses sprayed a one-base knock into right field, and SS Johan Camargo ripped an RBI single into right field to cut Potomac’s lead to 7-2. Then, Harper hooked a line drive to Sanchez at second base to end the game. The Nationals are (26-0) when leading after eight innings thus far in 2015. In the series finale tomorrow night, Potomac will park RHP Nick Pivetta (6-4, 2.45), a 2015 Carolina League All-Star, on the mound to face off against Carolina RHP Brandon Barker (3-1, 2.48). 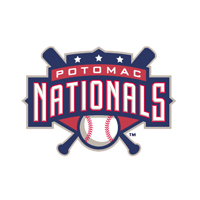 The Potomac Nationals Baseball Network will carry live coverage of the game beginning with the “P-Nats Lead-Off Show” at 6:50pm before the live play-by-play at 7:05pm. P-Nats Gameday Audio on the Potomac Nationals Baseball Network is accessible at www.potomacnationals.com or with the TuneIn Radio App. Set Game Two will begin with a 7:05pm first pitch on Tuesday night at The Pfitz. Gates to the Home of the P-Nats will open at 6:00pm in preparation for $2 Tacos and Tallboys on Tuesday.